Residents of Japan will be vaguely aware of the long-nose impish figures known as Tengu, thinking of them as piquant figurines without deep religious significance. Tengu take many shapes in Japanese folklore, for instance as mischievous kidnappers of children or Pucks leading travelers astray. 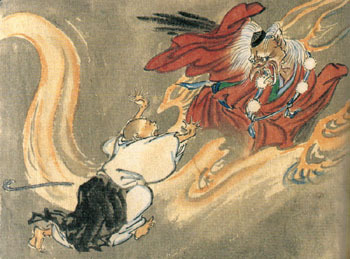 Haruko Wakabayashi focuses on a grimmer aspect of the imp, as he appears in Buddhist thought, connected with evil forces such as the demon Mara who distracts monks from their spiritual path. She shows how Buddhists used Tengu images to “demonize” challengers of authority and to shore up their own institutional legitimacy. If Tengu are really so wicked, it may become hard for us to look on them benignly any longer as cute ornaments. But perhaps what Buddhist monks see as evil is really only something mildly naughty. In any case the author is of the devil’s party, locating the real “evil” in the repressive Buddhist establishment, though she does not develop this idea very much. In the Kamakura Period, adherents of new forms of Buddhism, including Zen, were denounced as falling into the realm of Tengu (tengudo), a novel addition to the six realms usually distinguished. Speaking though a possessed woman, a Tengu revealed to the Tendai monk Keisei in 1239 that lots of important religious and political figures were consigned to this realm, including Emperors Sutoku and Goshirakawa. This leads to a rhetoric about the nonduality of good and evil that is hard to swallow. Mara and the Buddha are one and the same; “hell and heaven are both pure lands”; “Tengu are indeed buddhas as they are, regardless of their evil nature”; “evil is affirmed as being one with the good.” Do such declarations do justice to the reality of evil? Wakabayashi suggests that having a good understanding of evil helps one to pursue enlightenment more effectively. Even the Buddha has an evil nature, in this sense, but it does not necessarily lead him to commit evil deeds. Evil and good are one only for those who recognize evil as evil, and sincerely undertake reform. The lecture meeting known as the Yuima-e was in a state of decline at this time, and the scrolls present it critically. A lecturer has the beak of a Tengu, and the ritual dance is presented with emphasis on the monks’ profane enjoyment, extravagant costumes, and voyeuristic interest in the boy dancers. The other two scrolls target the new schools of Buddhism. Ippen (1239-1289) is depicted as in the hagiographic Ippen hijiri-e distributing food to the poor, performing the nenbutsu dance, and distributing slips of paper bearing the name of Amida Buddha; then, with mocking intent, he is portrayed giving out his urine, an unclean medicine for his less well-off followers. These new Buddhist leaders are consigned not to the realm of Tengu, where they could still seek enlightenment, but to that of beasts. Haruko Wakabayashi may not have solved the problem of evil, but she has brought into focus a neglected chapter in Japanese culture, revealing its unsuspected depth and coherence. the Tengu and the Buddihsts are the same in diferent perception.